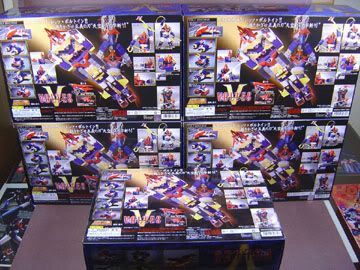 I can’t believe after 52 SOC releases(counting the repaints, 53 if you count the Iron Castle to be true) it’s finally here! 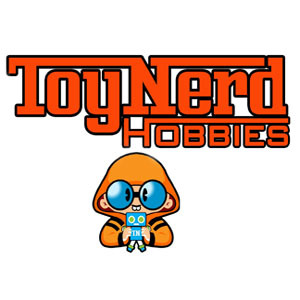 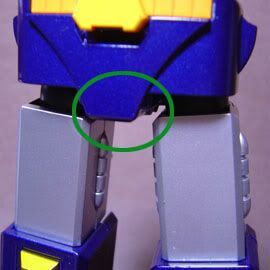 Also, the “Popy styled” windows are just cut-outs, hehe no celophane/acetate windows glued to them. 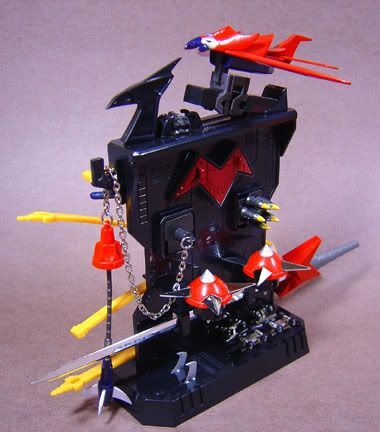 -there’s also a part in the c0ckpit that opens up, I’m not sure what it’s for. 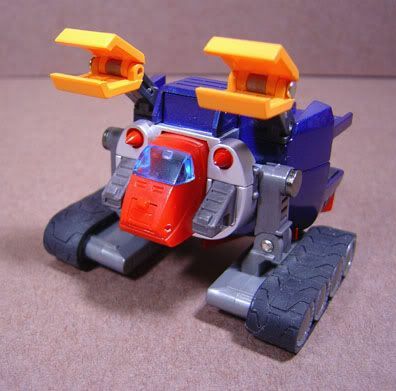 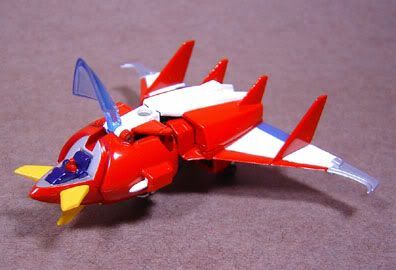 -wheels have “shock abosorbers” in them(press them down they spring back when released ) nice..
-Make sure the Bomber wings are in the right position, there’s a nub and hole system in the wingslots, that’s where the wings are supposed to lock in. 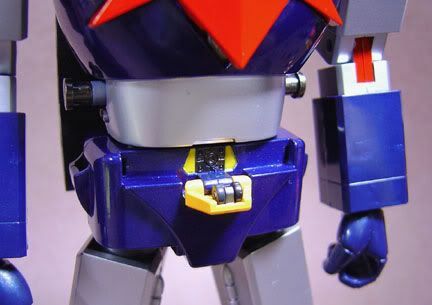 BTW it turns out the whips/belt doesn’t actually retract, the front belt is a plastic piece that just comes off. 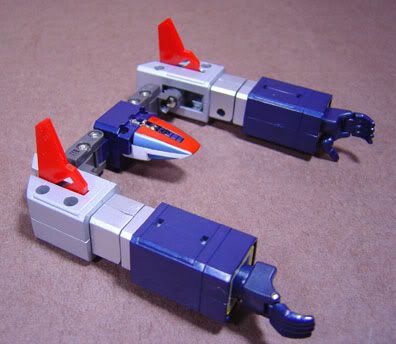 -Connection of Frigate and Lander.. snap on slots.. although the pieces are made of very, very tough plastic.. give it a decade or so and by then who knows, maybe it might get brittle..? 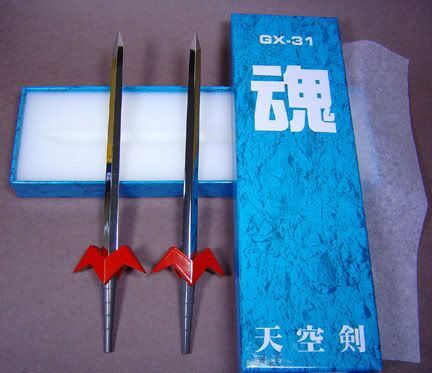 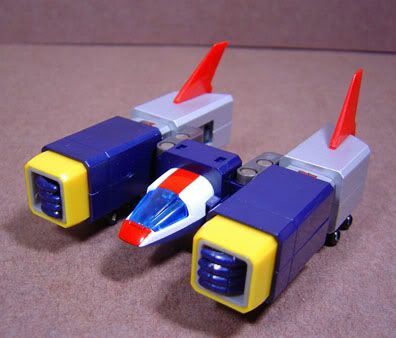 I miss the spring release triggers on the Popy. 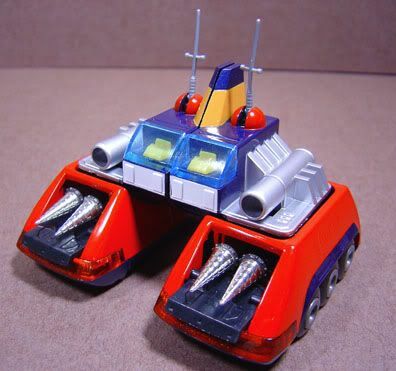 Also for some strange reason the Panzer tank legs’ pin can be pulled out on mine(one side only), not to mention the “hubcaps” on one of the Panzer wheels also came off(not enough glue used?) 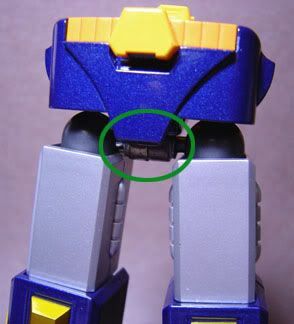 anyone else encounter this? 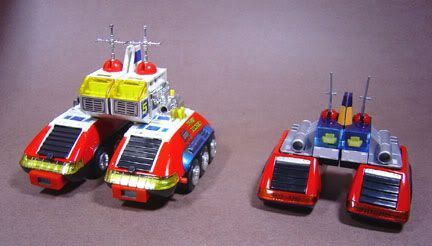 Finally as a parting shot. 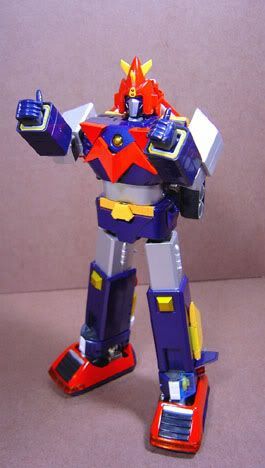 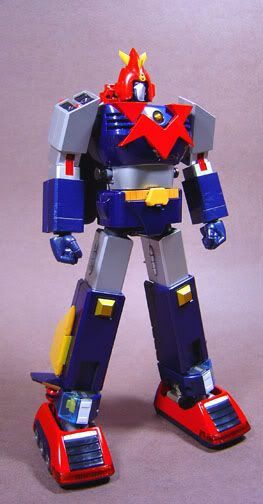 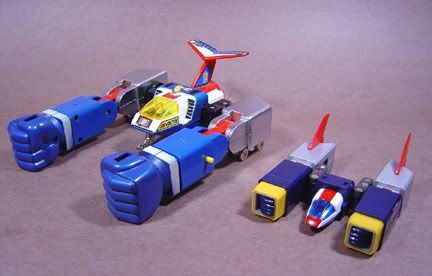 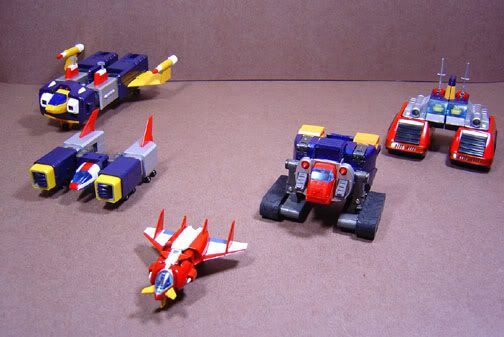 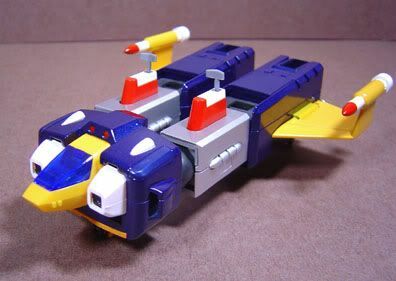 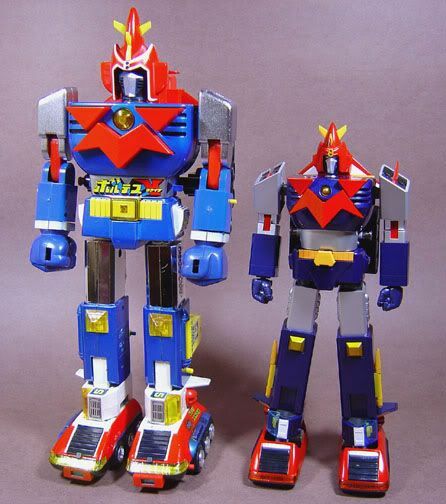 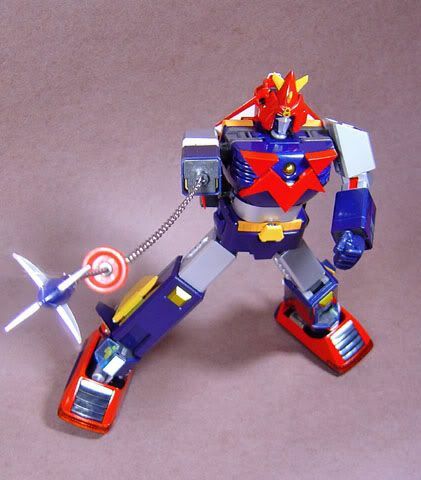 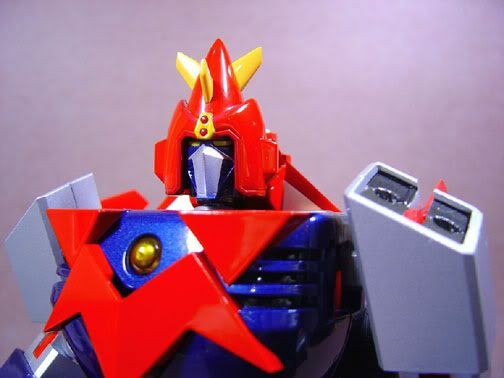 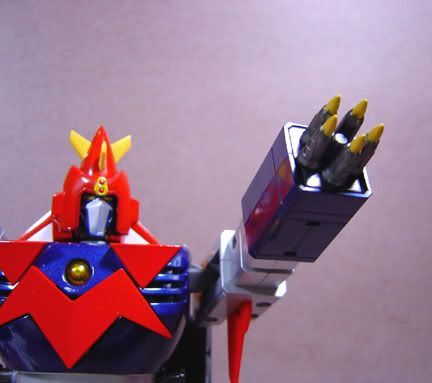 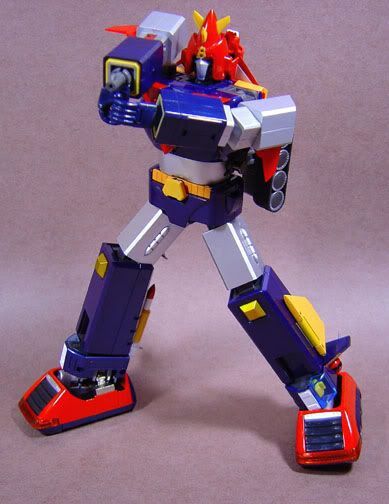 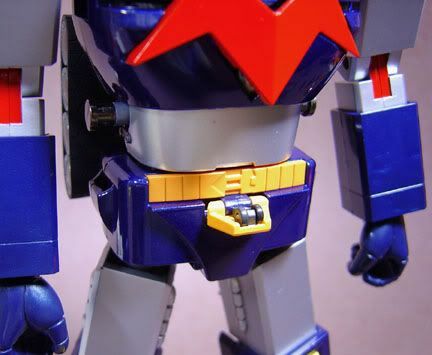 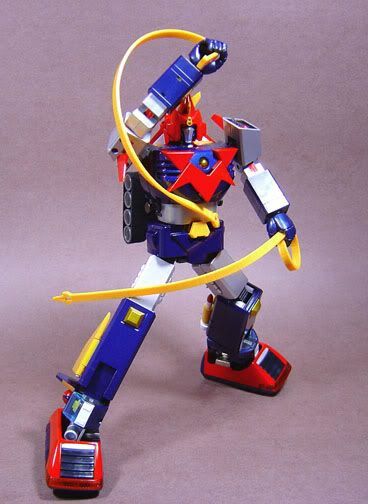 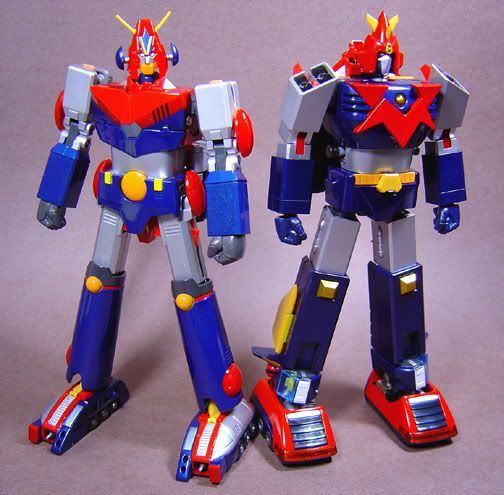 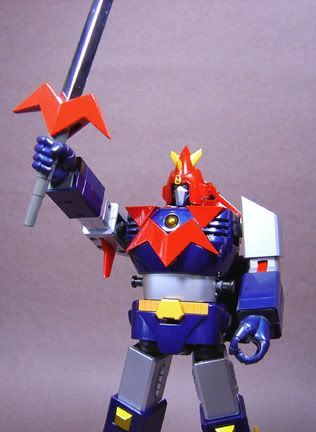 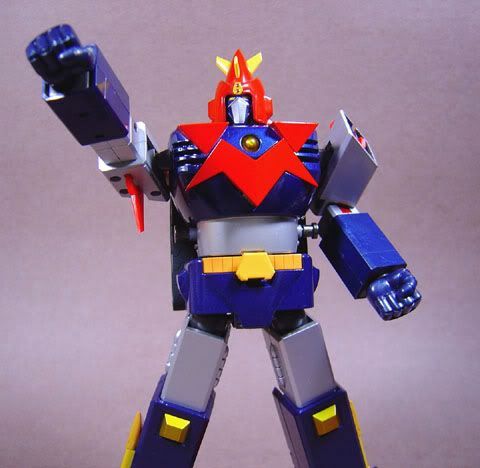 Voltes was in this pose(I modified it a bit) when I saw him for the first time 23 years ago in the opening sequence on a Betamax tape(the US English dubbed one with 5 episodes). 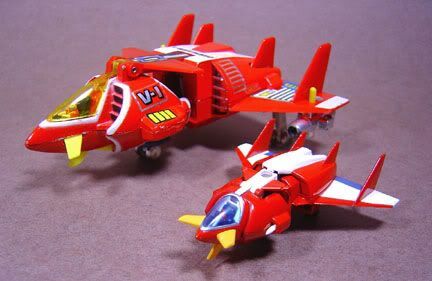 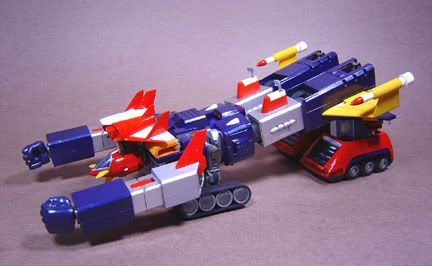 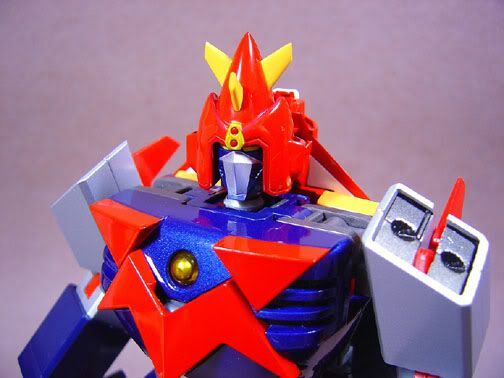 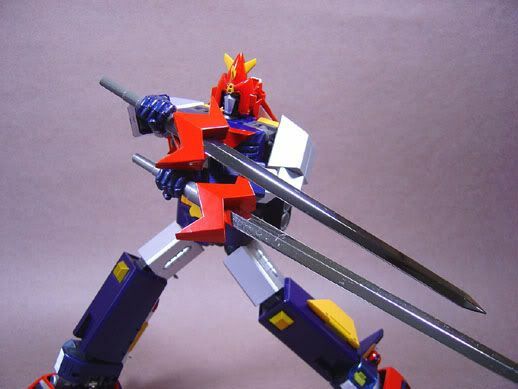 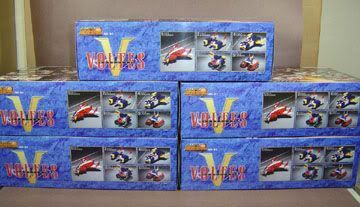 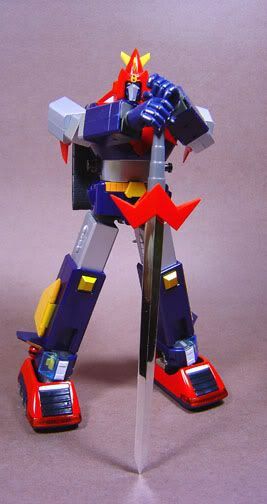 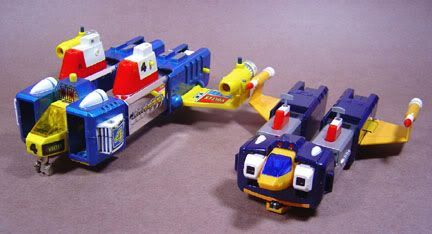 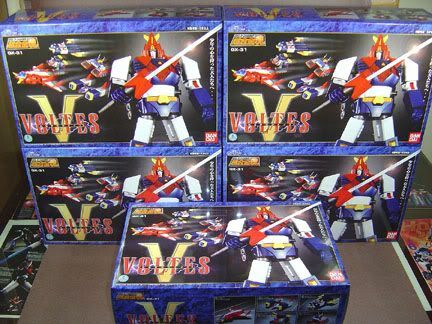 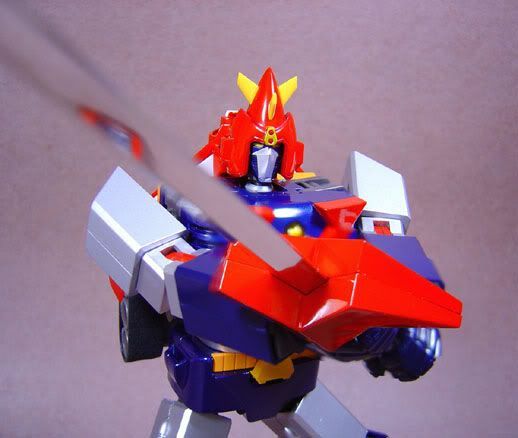 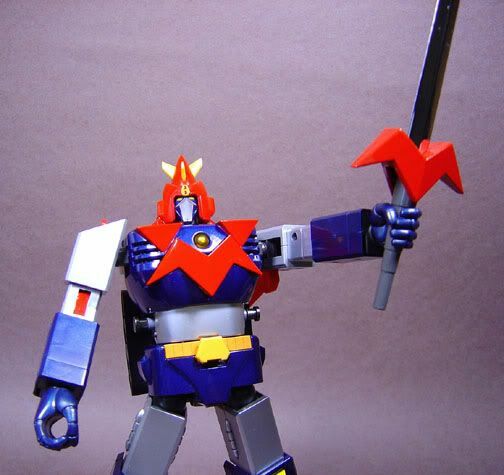 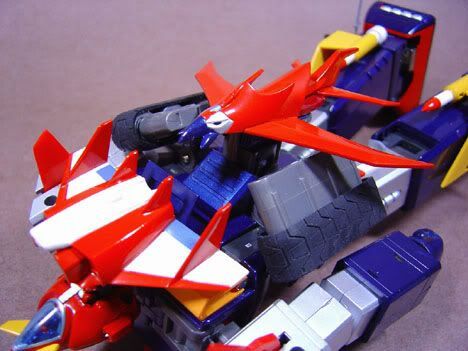 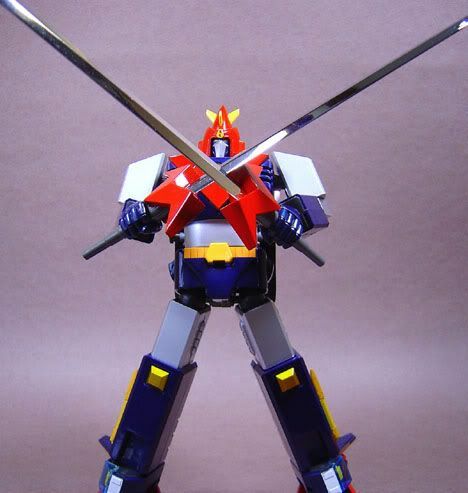 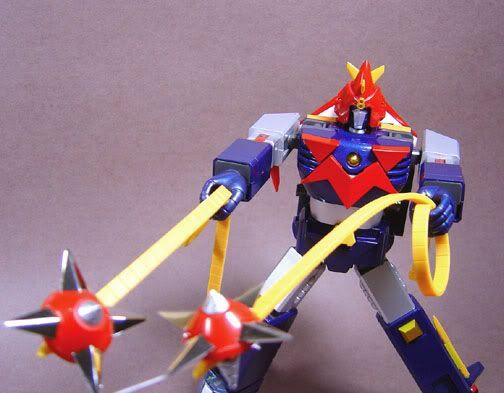 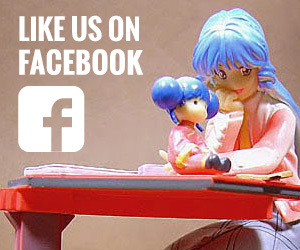 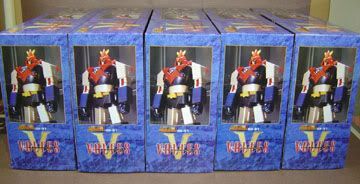 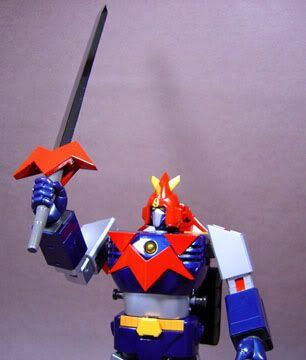 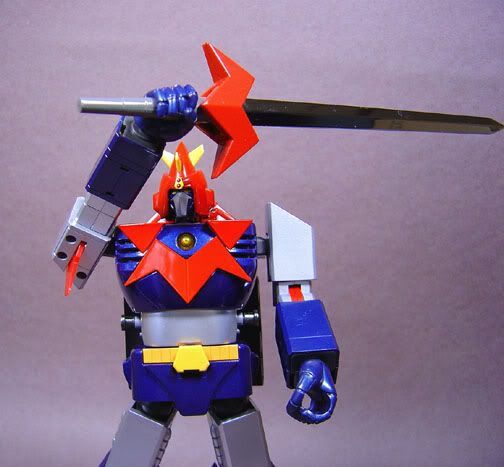 Thankfully Voltes can support the heavy sword. 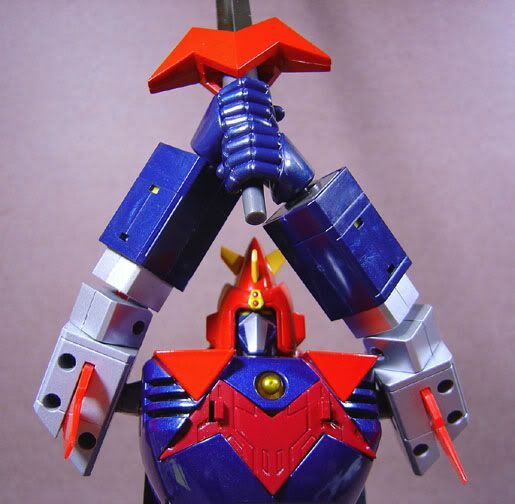 You just have to carefully balance it right and not abruptly release your supporting grip on the sword otherwise the arm will come swooping down(regardless of the shoulder ratchet joint, given the right momentum). 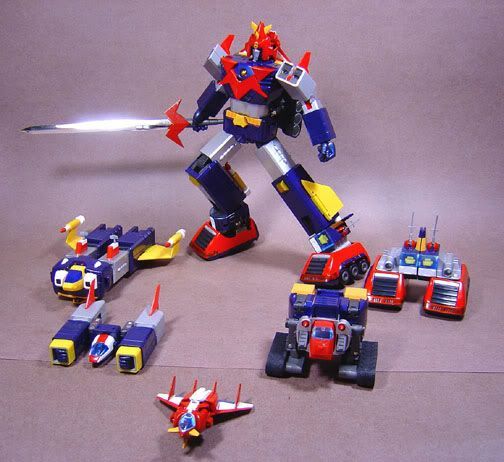 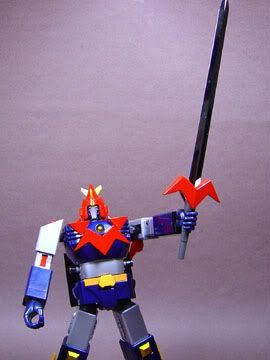 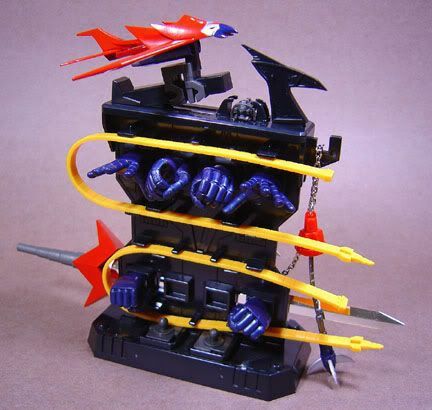 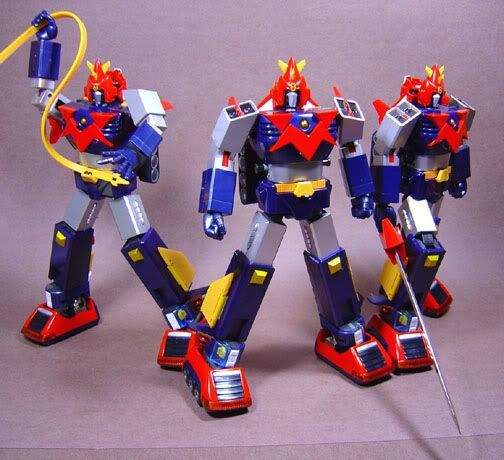 Please also note that in all the pics, Voltes is slightly tipped backwards to balance his center of gravity, no way can he hold the sword forward and not topple over from the weight. 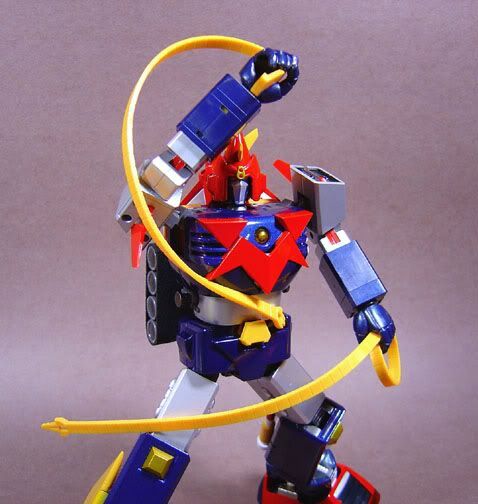 He can also do the “lighting” pose while holding it. 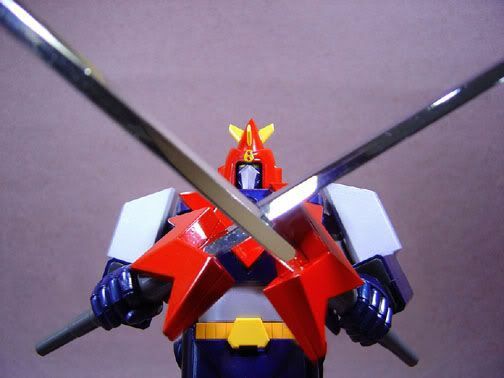 Hehe, Combattler’s not the only one with the dual blades anymore now is he? 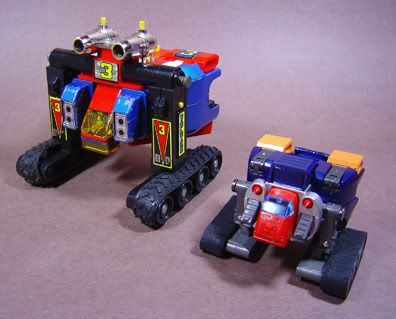 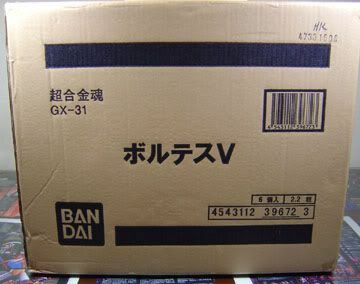 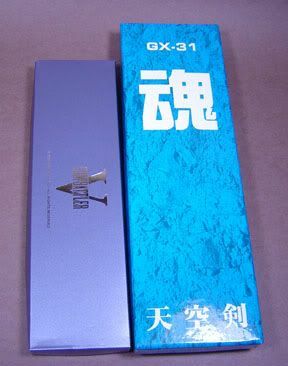 Finally, a box comparison shot with the Gx03 “legit” diecast twin lancer, the “Soul” Tenkuken box is bigger and thicker.